Technology has taken a giant leap forward in the last few years by expanding the traditional tool of demographic research into an analysis of lifestyles and consumer spending behavior. The old-school strategy was to look at population count, income, and age to determine a good location for a business. But new-school tools such as leakage factor, retail gap, and Tapestry lifestyle analyses take decision making to a higher level and reduce the risk of failure. This article examines how these new technologies can help commercial real estate professionals make better real estate decisions. We examine an actual 10 acre tract in New Orleans, utilizing the latest technology of the Certified Commercial Investment Member database to generate sophisticated site analysis information on the best use by examining the lifestyle of the residents in the area — and how they spend their money — to determine what retail businesses were needed. Typically the target-area population analysis looks at demographics within a radius of 3 miles, 5 miles, and 10 miles. However, a better approach is drive-time analysis, which provides more-useful information when there are natural boundaries to an area: For example, north of New Orleans is Lake Pontchartrain and east of New Orleans is a wetlands area and wildlife preserve. Traffic counts also provide useful data, particularly for retail site analysis. The 2008 traffic study by the Louisiana Department of Transportation showed Interstate 10 traffic in New Orleans East at 34,000 cars per day, and the 2010 estimate from Datametrix (www.stdb.com) is 30,000 cars per day. 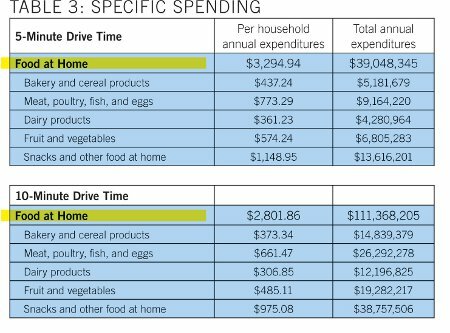 Two conclusions can be drawn from consumer spending data. 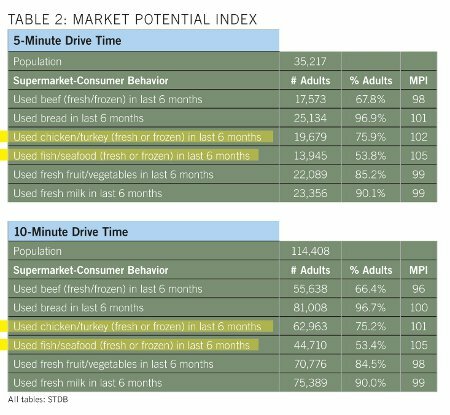 First, the MPI exceeds 100 on seafood and chicken/turkey in both the 5- and 10-minute drive time areas, revealing a higher than average propensity to spend on these items. Second, the population is high enough to support at least four supermarkets, using the market assumption that a 50,000-square-foot supermarket needs approximately 8,000 residents. Retail Opportunity. Using industries categorized by North American Industry Classification System, or NAICS, codes, we can pinpoint where demand exceeds supply and shows a need for a business to fill a void. We determine supply by estimating sales to consumers by establishments, while excluding sales to businesses. We forecast demand, or retail potential, by estimating the expected amount spent by consumers at retail establishments. The gap between demand and supply is called the leakage factor, which presents a snapshot of retail opportunity. This is a measure of the relationship between supply and demand that ranges from +100 (total leakage) to -100 (total surplus). 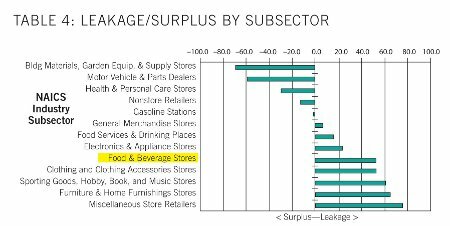 A positive value represents “leakage” of retail opportunity outside the trade area. A negative value represents a surplus of retail sales, a market where customers are drawn in from outside the trade area. NAICS represents one of the most profound changes for statistical programs focusing on emerging economic activities. The system groups establishments into industries based on their primary activity. NAICS moves down in detail from sector to subsector to group then to industry. This is an improvement over the previous method, the 1987 Standard Industrial Classification, or SIC, system. Zip Code. Retail Marketplace Reports are available by theme, such as grocery store sales, and can drill down to county, city, zip, census tract, and block group, the smallest unit of measurement of census data. Themes can get very specific, even down to a map of the population that used aluminum foil in the past six months. We searched for grocery store sales by zip codes south and west of the target area that are above $28 million; since there is only one Winn-Dixie store in that area, we know the market will bear additional stores. We can use information on expected sales to right-size building square footage and land area. Tapestry Reports. Tapestry identifies neighborhood segments and describes the socioeconomic quality of the immediate neighborhood. 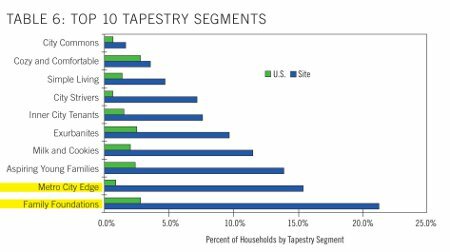 The index is a comparison of the percent of households or population in the area, by Tapestry segment, to the percent of U.S. households or population by segment. An index of 100 is the U.S. average. Our use of technology has delivered important information for determining the best businesses for the target 10-acre site while reducing risk of business failure. 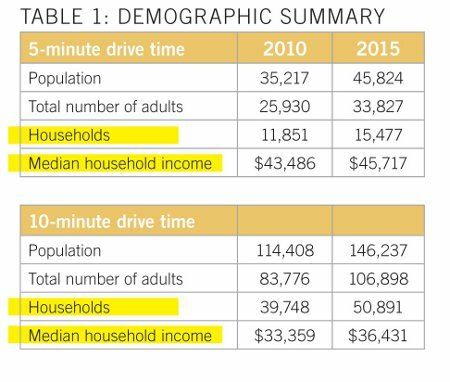 We have progressed from simply knowing the population count, age, and income to knowing detailed information about who lives in the target area, how they spend their money, and what businesses are missing that could satisfy that demand. We have been able to conclude the target area has the highest unfulfilled demand for furniture, sporting goods, clothing, and food stores, and we have been able to forecast the total sales of a future grocery store and can plan our capital expenses such as store size accordingly. We know what makes the nearby residents unique and where they spend more of their money compared to the average consumer, so we also can lower our inventory costs by stocking the goods with the highest demand. We also can reduce our advertising costs by targeting the media that our customers will use. These new-school tools are available to everyone facing a real estate decision, not just the Walmarts of the world. Read the original publication in CCIM magazine here.